"After a post-lunch nap, we headed into Hoi An proper. The town is a little touristy, and seems to be known for silk tailors and leather bags. Want a custom-made suit? You can find a place here that can have it done in a day or two. Hoi An also bustles with little cafes and food stalls packed with tourists from all over the world, including many bohemian backpacker types. We went to a restaurant called Miss Ly�s to try three classic Hoi An dishes. First, the White Rose is a small shrimp dumpling that is boiled and topped with fish sauce and chilies. The dumplings are made by the same family that has been making them for years and sells them to everyone, so this dish is pretty much the same no matter where you try it in the city. The next is a crispy wonton topped with tomato braised chicken". 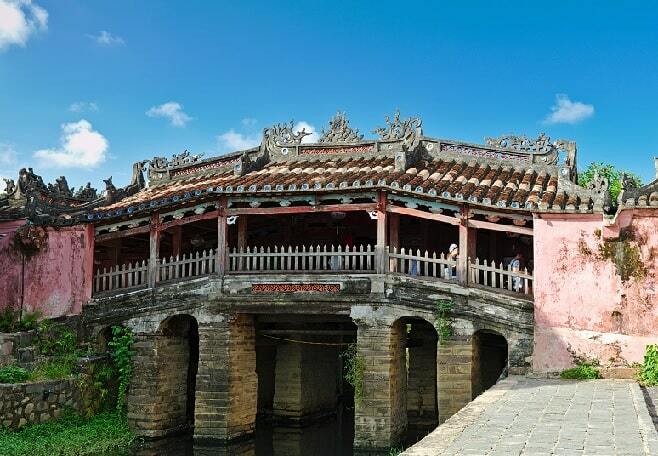 Hoi An - is the most graceful, most atmospheric, city of Vietnam. Earlier this wonderful city was a major port, today it has a grand architecture and a seductive setting by the river. The city fits properly on her heritage. The 21st-century curses of traffic and pollution are ignored this cozy town. The town center is pedestrianized. 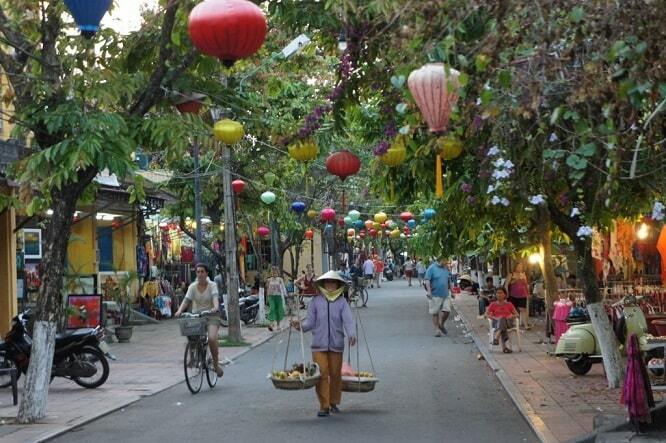 The relaxing, provincial attitude and remarkable harmonious character of Hoi An owes more to luck than planning. If the Thu Bon river was not bogged down in the late 19th century, so that ships could no longer reach the city, Hoi An today would have been undoubtedly very different. A century long shrank the allure of the city untill an abrupt increase of tourists in the 1990s by the tourism boom transformed the local economy. Today, Hoi An is again a cosmopolitan melting pot, one of the richest cities in the country, a culinary mecca and one of the major tourist centers of Vietnam. Despite this revival of the economy, the old city kept its face. Her incredible legacy consists of faltering Japanese merchant houses, Chinese temples and ancient tea houses. The rice fields are gradually replaced by the residents to tourism companies. Lounge, boutique hotels, bars, travel agencies and a plethora of tailor shops are part of the everyday. And yet, by the market and on the island of Cam Nam, life has changed very little. If you're a few kilometers outside the city, there are beautiful cycling routes, or motorcycle rides, or boating trips. Several tempting landscapes and deserted beaches are within easy reach. . The Japanwse Bridge was first built in 1590 by the Japanese community in order to deal better with the Chinese quarters. Through the centuries, they remained relatively faithful to the original Japanese design. The construction is very solidly built, because of the danger of earthquakes. The inputs of the bridge are monitored by weathered images: a few monkeys on one side, a pair of dogs on the other side. According to an old story, they had chosen these images because many Japanese emperors were born in the year of the dog and monkey. Another story tells that the construction of the bridge began in the year of the monkey and was completed in the year of the dog. The access to the Japanese Bridge is free. You ask you for a donation for the small, impressive temple on the northern side of the bridge. 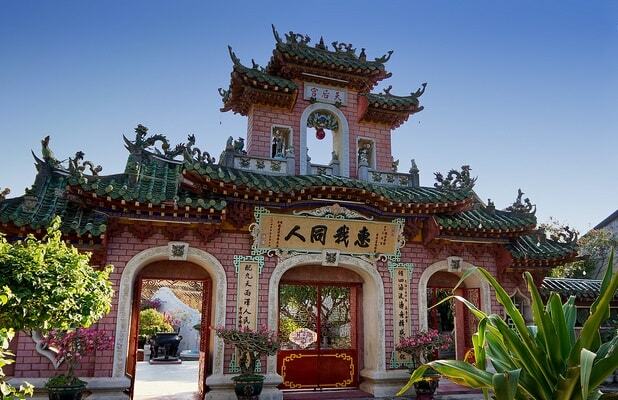 Originally the Assembly Hall was a meeting room, but was later converted into a temple for the worship of Thien Hau, a deity from Fujian province. The mural on the right wall shows Thien Hau, with a lantern that illuminates the road, when she was going to save save a sinking ship on a stormy sea. Opposite this wall painting you see on the wall the heads of six Fujian families who fled from China to Hoi An in the 17th century. The last room contains an altar with seated figures of the heads of the six Fujian families. Behind the altar on the right are three fairies and smaller figures, which represent 12 midwives. They teach small children skills that are necessary for the first year of life: smiles, sucking and so forth. Childless couples often come here to pray for offspring and leave behind fresh fruit as offerings. Old House of Tan Ky address: 101 Nguyen Thai Hoc Street - the old quarter of Hoi An. The House of Tan Ky is a perfect example of an 18th century merchant house in this former trading center. The name of Tan Ky, which means "Progress Shop" means, was given to the house by the 2nd generation flourishing business because it had become a thriving business. Despite the decline of trade in the city and the enormous devastation caused by annual flooding, seven generations have constantly sought to keep the property in good condition. 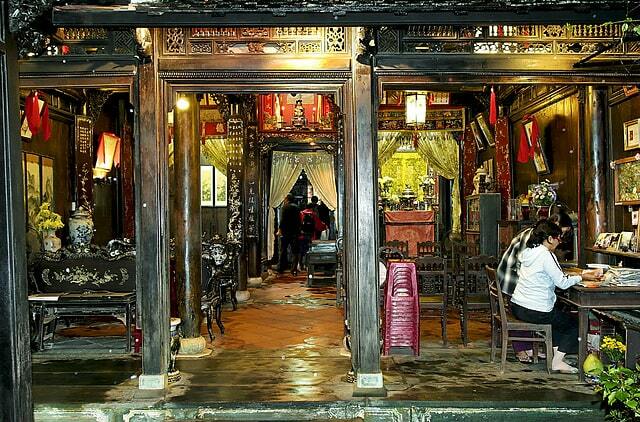 Therefore: if not the oldest, Tan Ky is the most well-preserved trading house remained in Hoi An. If you're near the Japanese bridge, walk Bach Dang street and you see Nguyen Thai Hoc street. It is recommended to visit this house in the morning or in the afternoon. Hoi An has lots of tailors and shoemakers .. It is sometimes said, "Take all tailor shops, shoe shops and souvenir shops away .... and nothing is left of Hoi An!" So it's good shopping in Hoi An. Hoi An are also plenty of restaurants where you can eat well. In every street there's a shop, if you want to get a suit or shoes. The general rule is, however, you have to fit at least twice the shoes of suit. I always take a photo with me of a beautiful costume, and I ask them if he can make that model. Usually they do. Sometimes there are books ready with the latest models from the famous fashion houses. However, when you fit a suit, there are still questions about one or two slits behind or questions about the pockets. Obviously a bespoke suit is much cheaper than one in my country. An hour's drive from Hoi An is the Hindu temple complex My Son. There are from Hoi An organized excursions, which take about six hours. However, you can also arrange a visit to the tempel complex on your own. Cham Island is an island off the coast of Hoi An. Here is a diving center called Cham Island Diving. Cham Island Diving also offers snorkelling trips from Hoi An. A trip includes a stay on the island (basic camping). You can choose the ferry to the island to explore the local village of Bai Lang. When it's bad weather, you better avoid a trip to the island. Nestled in the heart of Cam Pho, Cozy Hoian Boutique Villas is an ideal spot from which to discover Hoi An. The hotel is not too far from the city center: just 0.3 km away, and it normally takes about 35 minutes to reach the airport. With its convenient location, the hotel offers easy access to the city's must-see destinations. At Cozy Hoian Boutique Villas, the excellent service and superior facilities make for an unforgettable stay. Top features of the hotel include 24-hour room service, free Wi-Fi in all rooms, 24-hour security, convenience store, daily housekeeping. Guests can choose from 17 rooms, all of which exude an atmosphere of total peace and harmony. The hotel's recreational facilities, which include golf course (within 3 km), garden are designed for escape and relaxation. 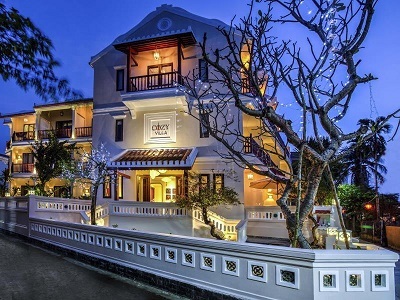 Whatever your purpose of visit, Cozy Hoian Boutique Villas is an excellent choice for your stay in Hoi An.